Now let’s move on from LEDs to more fun stuff! 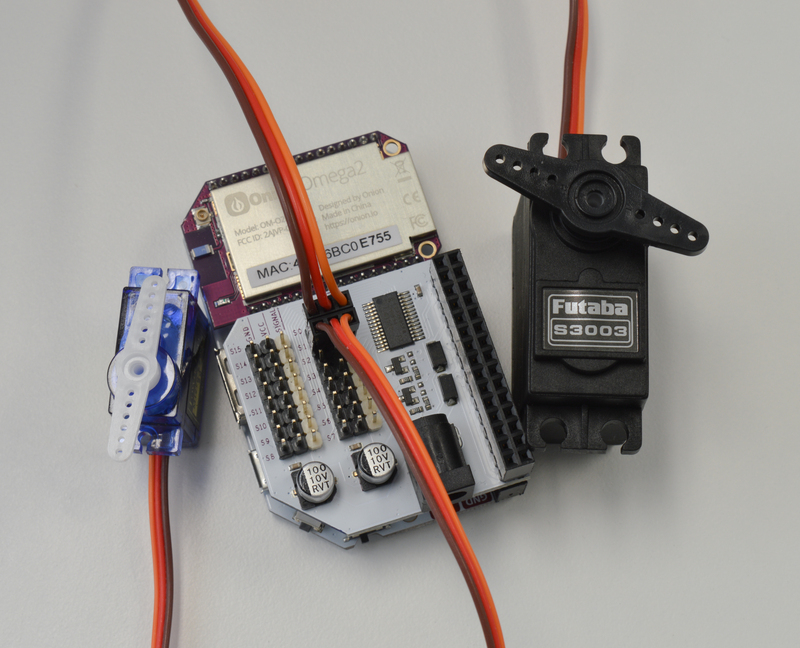 In this experiment we will learn how to control servo motors using the PWM Expansion with Python. Servos are one of the staples of any motorized project, so let’s get right to it! First, let’s review the basics of PWM as we’ll be using it a bit differently. In this context, the Duty Cycle indicates what percentage of the time a signal is ON (at logical high - high voltage). Consider a PWM signal with a 25% duty cycle: it will be on for 25% of the time and off for 75% of the time. Indicates the amount of time (usually in milliseconds) for each part of the cycle. The Time On, Ton in the diagram above is the time the signal is high. This is also known as pulse width. Similarly, Time Off, or Toff is the time the signal is low. The Cycle time corresponds to the overall period of the PWM, or Ton + Toff. 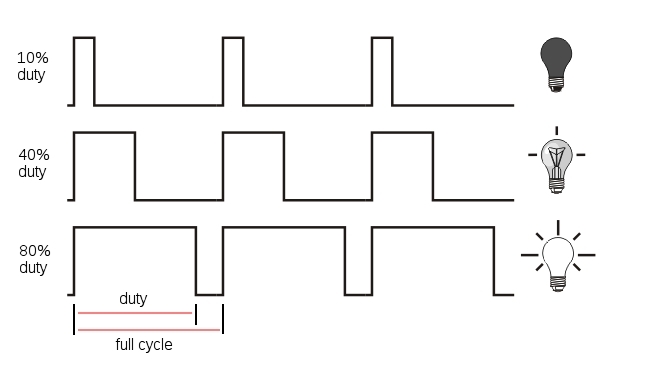 For example, a PWM signal with a total cycle time of 20ms has a frequency of 50 Hz. All this means is that the signal will complete 50 full cycles in a second. 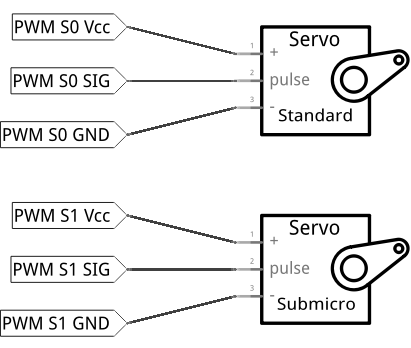 Servo motors are controlled by via a pulse width modulated (PWM) signal. Servo motors usually have three wires: power, ground and the control signal. Most servos fixedly rotate between 0° and 180° - starting and ending at fixed points relative to the motor. They accept pulses within a fixed range commonly between 500 and 2500us. To put it all together, say we send a 500us width pulse to a servo accepting pulses between 500us and 2500us. The servo will rotate its arm to the 0° position in response - no matter which position the arm was in before. It will respond with appropriate increments when the pulse width is increased up until 2500us, then it will stop moving. When the servo is receiving signals continuously, it will apply force to attempt to stay in the position that is being signalled. When the servo is unpowered and sent no signals, it won’t actively try to restore position. Manually moving the servo arm is possible when unpowered, but it should not be done as it can damage the servo. For most servos, providing a 1.5 ms pulse width will place the shaft in the neutral position. Anything greater or less will move the shaft clockwise or counterclockwise. Typical servos can only move 90˚ in either direction from the neutral position. 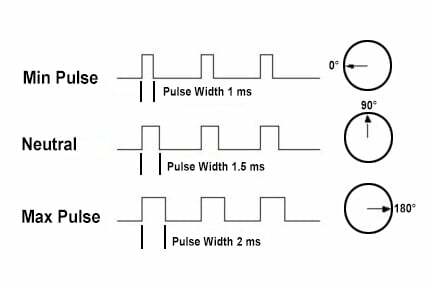 Note that the minimum and maximum shaft positions correspond to minimum and maximum pulse widths, these can vary between servos, so make sure to look at your servo’s datasheet. The recommended PWM frequency for servos is typically in the range of 40-200 Hz, with most servos using 50 Hz. For our experiment, we’ll demonstrate how servos can be controlled through PWM signals. We’ll connect them to the Expansion, then write some code to make them rotate. We touched on PWM very briefly before, but to operate servos, we’ll have to go a bit deeper. The PWM Expansion was designed with servos in mind, and its headers allow you to plug standard servos straight into the Expansion. This experiment circuit is relatively simple because you only need to plug the servos into the board. If you haven’t already, it is highly recommended that you read over the PWM Expansion article in our documentation for safety tips. Plug the PWM Expansion into your Expansion Dock. Plug the power cord of the Standard Size servo motor into the S0 channel of the PWM Expansion. make sure the orange wire from the motor is connected to the pin with the white base on the Expansion! Repeat the step above with the Micro Servo connecting to channel S1. Let’s write another class to represent a servo motor based on the class we wrote in the previous experiment. """Class that uses PWM signals to drive a servo"""
"""Move the servo to the specified angle"""
"""Set duty cycle for pwm channel"""
Paste the code below into a file called MAK02-servoControl.py, make sure your circuit is set up, then run it and see what happens! First, the motor shaft move to the 0 degree position and stop for two seconds. Next the shaft will move back to the 90 degree (neutral) position and stop for another two seconds. Finally it will move in the other direction to the 180 degree position and stop for another two seconds. Since the pattern will repeat infinitely, you will need to break by entering Ctrl-C. This is because the servos will continue to be sent signals if the oscillator remains on. Although the arms won’t be swinging, the motors will be running needlessly and drain power. In simple experiments like ours, we can use infinite loops to make sure our program always runs. Other devices such as thermostats, and digital clocks can also be implemented using infinite loops. In these loops, conditions and states can be evaluated over and over again. After the conditions are checked, actions that require those conditions can be performed. For example, a thermostat would evaluate the temperature of the room over and over again. When it detects the temperature to be lower than some value, it can turn on the heat; and if it’s higher than some value, it can also turn off the heat accordingly. In this example, the loop doesn’t check anything, only progressing through the commands one-by-one. Be prepared for that to change in the upcoming experiments though! In this code example, you can find integer numbers along with decimal points (eg. 3.0). The reason 3.0 is used instead of 3 is to tell Python to interpret the number as a decimal, or floating point number. This makes it behave like a number in a calculator. If we dropped the decimal point (simply using 3), we’d be doing integer math. In this case, Python will literally drop the decimal part of any calculation. Sometimes we want this behaviour, such as when counting objects or iterating through loops. But this behaviour can be the source of large errors if you need to do precise calculations! You can see in the first two examples that the decimal part is dropped from the answer. In the last two you can see this error can carrying forward, causing a huge error! This applies to many other programming languages due to the way decimal and integer numbers are handled by computers. Be careful! As we’ve mentioned in the Starter Kit experiments, the Omega has a microprocessor which executes code extremely quickly (500MHz), while on the other hand servos are mechanical devices and can only react to command changes up to a certain point (50Hz ~ 1kHz). If a program like ours runs on the Omega with no time delays built in, the Omega will change the servos’ PWM signals faster than they can interpret them. This can cause unexpected behaviour; for example, your servos may twitch as they struggle to keep up. The Python time library and time.sleep() function calls are crucial to make sure there’s enough time for the servo to react to command changes. In reality, there will always be minor differences in mechanical hardware between motors even if they’re of the same make and model. This can be due to slight variations in manufacturing, how well it was assembled, and so on. For this reason, sending the same signals to two of the same motor may not cause them to behave exactly the same. The pulse width values we provided - 500 and 2000; 500 and 2500 - are values we’ve found to work with servos in our lab. Try playing around with these and seeing what happens; this process is called calibration. See if you can use the command line tools or the libraries to figure out what duty cycles correspond to what kind of movement in your own servos! Manufacturers almost always provide data sheets to let you know the characteristics and limits of your hardware. They’re definitely the best place to start when calibrating. If you want to do more advanced projects like a robot arm or a rover, you should provide an external power supply to the PWM Expansion via the barrel jack. This is because the PWM Expansion draws power from the Expansion Dock’s power circuitry. Heavy loads and multiple servos draw a lot of current, and the high power demand may exceed what the Dock is able to provide. Also, keep in mind that the Omega cannot be powered directly by this external power supply because the DC barrel jack’s positive voltage connection is isolated from the main power circuitry. For full details, see our PWM Expansion hardware article. Next time, we spin a motor.